Our first goal was to see how easy these projectors were to optimize and how well they performed after optimization. Here's a snapshot look at the performance for each of our three sample business projectors, the BenQ LH770 (5,000 lumens, $5,000), Optoma ZH500T (5,000 lumens, $2,999), and Epson Pro G7905U (7,000 lumens, $4,387). Video Optimized Modes. The LH770 lets you save changes to each color mode. Optimize each one, and you can use whichever mode delivers the best balance of brightness and image quality for the current level of ambient light as it changes through the day as a consequence of changes in sunlight coming in or turning lights on or off. The LH770 delivers acceptably realistic looking color despite some minor compromises. Adjusting color so blue skies don't occasionally turn green in sRGB mode, for example, yielded a slightly bluish black in a dark room. However, it was not noticeable with ambient light. Also, after adjusting brightness and contrast using display setup test patterns, Bright mode looked a little washed out. After optimization, the three most useful color modes were Bright for highest brightness; Vivid, which was almost as bright, but delivered better color accuracy and contrast; and sRGB for the best color accuracy and contrast. Color Preset Performance. Note that we tested an early production unit of the LH770 with firmware version 1.00 that suffered obvious color inaccuracies in all of its color preset modes, notably reds with a blue shift in some modes, and blues shifted toward red or green in others. After color adjustments, however, most colors in most scenes were well within a realistic range. BenQ says the color was tuned this way initially for some specific commercial applications, but firmware version 1.02, available on newly shipped units and to existing owners via a firmware update, provides a more color-accurate preset for film and video. According to BenQ, selecting the sRGB mode and turning off the DLP Brilliant Color feature delivers a color profile similar to BenQ's typical Cinema preset for those who wish to do less tuning out of the box. Users who need to perform the update should contact BenQ customer support for instructions. Low Brightness Mode. Eco mode lowers light output by roughly 21%, delivering 2,474 lumens for the brightest mode with optimized settings. Zoom Lens Effect on Brightness. The 1.5x zoom lens curtails light by roughly 23% at the full telephoto end of the range, giving a measured 3053 lumens in Bright mode with default settings. Brightness Uniformity. At 73% brightness uniformity with the lens at the wide angle end of its range and 76% at the telephoto end, the LH770 does better for uniformity than most inexpensive home theater projectors. A solid white image showed a touch higher brightness at the bottom middle and left, slowly dropping going up and to the right, but the difference is too little to see with movies or video. Video Optimized Modes. In addition to its predefined color modes, the G7905U can store 10 customized settings, which lets you calibrate, store, and retrieve optimized settings for multiple lighting conditions, from nighttime with lights turned off to bright daylight streaming through windows. It can also store 10 sets of combined settings for its powered zoom, focus, and lens shift, so you can easily switch between, say, 16:9 and Cinemascope 2.41 aspect ratios if you want a constant image height setup. It can even store three sets of geometric correction settings. 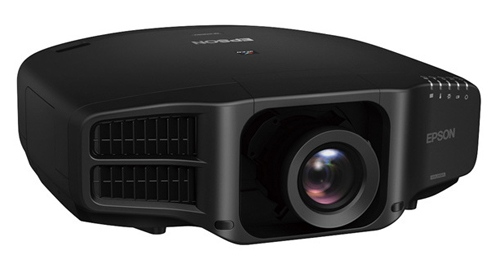 After optimization, the G7905U delivers a close color match to a reference projector along with suitable contrast and black level for video and film in Dynamic, Presentation, and Cinema modes. 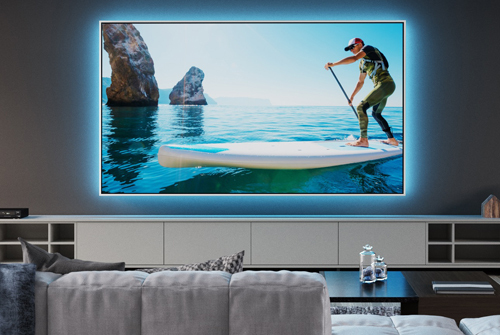 Even Cinema, with the lowest brightness of the three, delivers a whopping 5,115 lumens at 16:9 aspect ratio, making it bright enough to light up a 180" 1.0 gain screen in moderate ambient light. Color Preset Performance. The G7905U offers highly watchable video with default settings in all modes except Dicom Sim, which is meant for x-rays and the like. Cinema delivered the best contrast and most accurate, neutral color. It also did the best job holding subtle gradations in midtones. Dynamic and Presentation modes came in just a bit lower on all three scores. Multi-Projection and sRGB modes are best described as usable, but lacking saturation. They also delivered lower contrast and sense of depth than the other modes. Brightness. With default settings, the G7905U test unit essentially matched its 7,000-lumen rating, measuring 7,049 ANSI lumens. That's a touch brighter than the G7905U we looked at for a Road Test back in 2016, but within the expected variation from one unit to another. Low Brightness Mode. Eco mode reduces brightness by 22%, leaving the optimized version of the brightest mode at a solid 4,858 ANSI lumens. Zoom Lens Effect on Brightness. The standard 1.6x zoom lens for the G7905U curtails light by only 16% at the telephoto end of the range, a lower than typical drop in brightness compared with the wide angle end for this level of zoom. For Bright mode with default settings, Normal power, and 16:9 aspect ratio, it translates to 5,265 ANSI lumens. Brightness uniformity. The measured 80% uniformity for the G7905U is lower than the 89% we saw with the earlier test unit, but high enough that few, if any, will consider it a problem. A solid white test image shows the bottom left corner as the brightest area, with brightness dimming slightly going up and to the right. With video and film, the difference was impossible to see. Video Optimized Modes. The ZH500T can save modifications to only one color preset mode. Make any change to any preset, and the changed version immediately becomes the new, and only, User mode. Rather than adjusting color and other settings every time you change the color mode, it makes more sense to pick one to modify and save, and use the default settings for other color modes you may switch to occasionally when you need a different brightness. We suspect most people will chose Bright mode as the preset to start with for video optimized settings for the same reasons we did. In addition to it being the brightest mode, we were able to adjust the color to fall within a realistic looking range in the vast majority of clips we looked at without changing the measured brightness significantly. With its default settings, Bright mode has a slight green bias that shows primarily in skin tones. However, it can be adjusted to a nearly neutral color. And at 4,195 ANSI lumens, it is bright enough to fill a 180-inch diagonal 1.2-gain screen in moderate ambient light. Color Preset Performance. Straight out of the box, Movie mode has a slight green bias, but less so than Bright with default settings, while Blending mode has the most obvious green shift. Presentation mode offers more accurate color by default, but loses subtle gradations in midtones, which makes rounded objects like close-ups of faces look flat instead of three dimensional. Dicom Sim is designed for medical images like x-rays. For the most accurate color out of the box, but lowest brightness, sRGB delivers 1,350 ANSI lumens—enough to light up a 100" 1.2-gain screen in moderate ambient light. Low Brightness Mode. We measured Eco mode at 32% lower brightness than Normal mode, or roughly 2,860 lumens for the video optimized setting. Zoom Lens Effect on Brightness. The 1.6x zoom lens curtails light by roughly 32% at the full telephoto end of the range, for a measured brightness of 2,860 ANSI lumens in Bright mode with default settings. Brightness Uniformity. The ZH500T's brightness uniformity came in at a solid 85% with the lens at its full wide angle setting and 74% at the full telephoto end of its range. With a solid white image, the bottom center is the brightest area, with the brightness dimming slightly going up and to each side. Even at the full telephoto setting, the uniformity is better than most inexpensive home theater projectors offer, and too little to see with photorealistic images. Contrast & Black Level: Do you need an ALR screen? You don't have to look much past our ANSI lumen measurements to see that all of these projectors can deliver a bright enough image to stand up to a high level of ambient light at a reasonably large image size. The least bright of the three—the LH770—delivers nearly 2,500 lumens after optimization, even in Eco mode, and just over 3,100 lumens in Normal power mode. The brightest—the G7905U—delivers just shy of 4,000 lumens in Eco mode using the color mode with the most accurate color, and a touch over 5,100 lumens in Normal power mode. For context, on a 110-inch diagonal 1.2-gain screen, the lowest of these measurements—2,500 lumens—translates to roughly 84 foot lamberts (fL) or about 287 nits, which is in the range of a reasonably bright SDR LCD TV. The highest—5,100 lumens—translates to about 585 nits, which is well into HDR LCD territory. Note that there are substantial differences between various ALR screen materials. We picked SI Slate 1.2 because it is one of the more popular choices out there, and we picked a 110-inch diagonal size for both screens as an appropriate—and common—size for a family room. The Slate material needs a minimum throw of 1.5 times the screen width for ALR to work well, so larger screens need bigger rooms to accommodate the minimum throw. Room lighting plus daylight conditions. For the daylight conditions, we used lamps designed to replicate natural daylight and placed them in several positions—one position at a time—where a window might be on a wall perpendicular to the screen. As a torture test, we also hung two lights on the ceiling pointing at the screen, the way you might light a picture on a wall. We wouldn't expect anyone to do that, but similar lighting conditions could happen unintentionally. In newer construction in at least some areas of the U.S., for example, cathedral ceilings with skylights are common in family rooms. What's the Real Difference between Standard and ALR Screens? As you would expect, we saw similar results with all three projectors, the only important factor being that the brighter the image, the better it stands up to ambient light. Given the overlap in brightness ranges of the projectors we tested with—depending on color mode, power mode, and zoom level—it makes more sense to discuss most of our observations in terms of what we saw at different brightness levels rather than what we saw with each projector. The second difference is that colors get shifted on the SI Slate screen compared with a matte white screen. The shifts are minor, and it just means that the projector has to be calibrated differently for each screen—no surprise there, and something every projection enthusiast should already know. You'll want to keep that in mind if you start out with a white screen and decide to replace it with an ALR screen. And if you need to calculate the appropriate projector brightness for a screen of a given size and gain at any given level of ambient light, it helps to know that SI says the calculations are the same for ALR screens as for standard screens. In Dark Rooms. 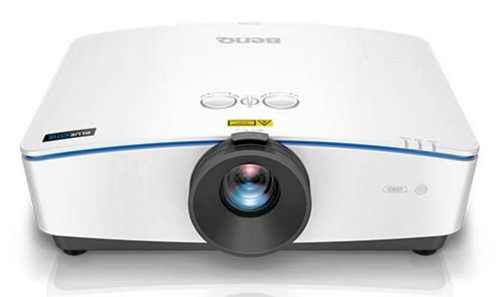 These projectors are such light cannons that with a 110-inch screen it is hard to make the images dim enough to meet SMPTE recommendations for viewing SDR images in a dark room. Forget the usual rule of thumb to aim for the 16 fL middle of the range. Even the top of the recommended range—22 fL—translates to less than a 700 lumen-requirement with a 1.0-gain screen at 110" and less than 600 lumens with a 1.2-gain screen. None of the models we looked at for this overview supports HDR. But note that even with the informal brightness recommendations for HDR, which range from 24 fL to as high as 50 fL (875 to 1,800 lumens for a 1.0-gain 110-inch screen), it's a challenge for these projectors to make the images dim enough for a dark room. The ZH500T can go as low as about 625 lumens with sRGB mode and Eco, but only with the lens at its full telephoto setting. Every other combination of color mode, power mode, and lens setting for all of these projectors is brighter. The key takeaway here is that most of the settings on all three projectors are too bright for comfortable viewing for a long session in the dark. Unless you use a larger screen size, plan on keeping at least some lights on with most projectors in this class, if only at a low level, to avoid eyestrain. Night with Lights On. In our typical-family-room-with-lights-on scenario, many people will be satisfied with a standard white screen. However, the lower the projector brightness, the more advantage the ALR screen has. Even at 6,200 lumens, the brightest mode we tested with, black is darker and contrast is better with the ALR screen. And the advantage increases at each step down in brightness. On the other hand, even at 3,100 lumens the picture is quite watchable on a standard screen without any killer shortcomings. Ultimately, whether the ALR advantage for this ambient light level is enough at any given projector brightness depends on how demanding you are. Perfectionists will want ALR to improve black and contrast even at 6,200 lumens. I suspect that at 2,400 lumens, most people will want it. Daylight. With our daylight scenario, you'll want the advantages of an ALR screen—period. Even with the brightest level we tested—6,200 lumens—the standard screen was unacceptably washed out on the side closest to the simulated window, no matter where we placed the lights. In comparison, SI's Slate ALR screen delivered a highly watchable picture at roughly 3,700 lumens and above. The brightness cutoff below that is a judgment call. Even at 3,700 lumens and higher, the 10% or so of the screen closest to the window could look a little washed out, even with an ALR screen. This was dependent primarily on the angle between window and screen. If you can't adjust positioning to avoid the problem, and aren't willing to put up with a slightly washed out corner or edge, you can always add a shade or drapes to the offending window. All this gives some definitive answers to the questions we started with. 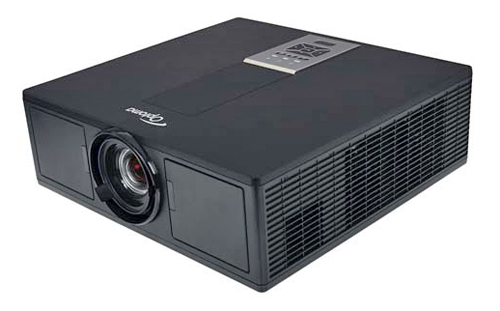 First and foremost, high brightness business projectors can indeed handle home theater and similar high-ambient light applications quite nicely, though with some modest caveats to keep in mind. First, they may not come with the fine-tuned video-accurate color modes that we see out-of-the-box with many home theater projectors—of any brightness. But some might, and some might be closer then others. And all three projectors that we tested provided the tools to make them look right. If you puchase a business projector like this for home use for more than $2,000, consider professional calibration. Second, these super-blasters don't necessarily translate well to a full-dark theater environment at more common screen sizes, where they may be too bright to avoid long-term fatigue in the absence of a good low-brightness mode. On the other hand if you're looking at this kind of high lumen count for a dedicated dark-room home theater, you're likely planning to a light up a rather large screen, in which case this won't be an issue. Another key conclusion is that ALR screens, or at least the SI Slate model we tested, live up to their promise by boosting image quality in any ambient light—and in the dark—by noticeably improving black level and contrast. And for daylight use in bright rooms with windows, our conclusion is that an ALR screen is a necessity.